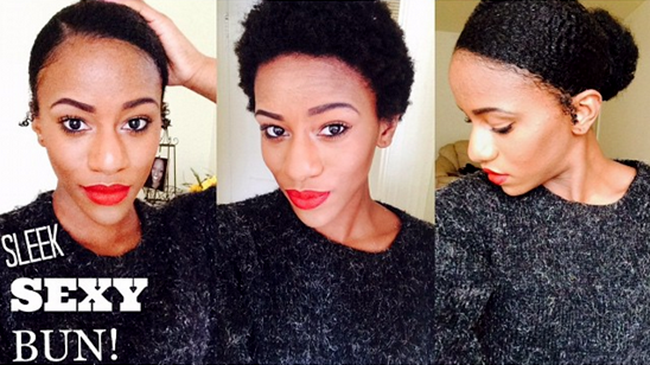 Having a TWA does not mean your styles have to be limited to a twist out or a wash and go. Get creative! Leah is eight months natural and is ready for a change. A lot of women who big chop anticipate the day they can achieve a effortless ponytail, but until you can do so with ease, here is a great tutorial. This low bun style is great for all occasions and is perfect for something quick when you are on a time crunch. *Starting on stretched hair makes this style easier to achieve. Shingle EcoStyler Gel throughout your hair starting from the nape and working your way up. Detangle each section with a comb or denman brush to help smooth it out and prevent tangles when you release the style. Place each detangled section into a ponytail holder to move it out the way. Smooth the hair in the ponytail with your hands or denman brush so that it lays flat. Spray your hair with water in the event that the sections toward the front begin to get dry. Create a part with a rat tail comb once you reach the front of your head. Fashion your Marley hair around your low ponytail and secure with a ponytail holder.